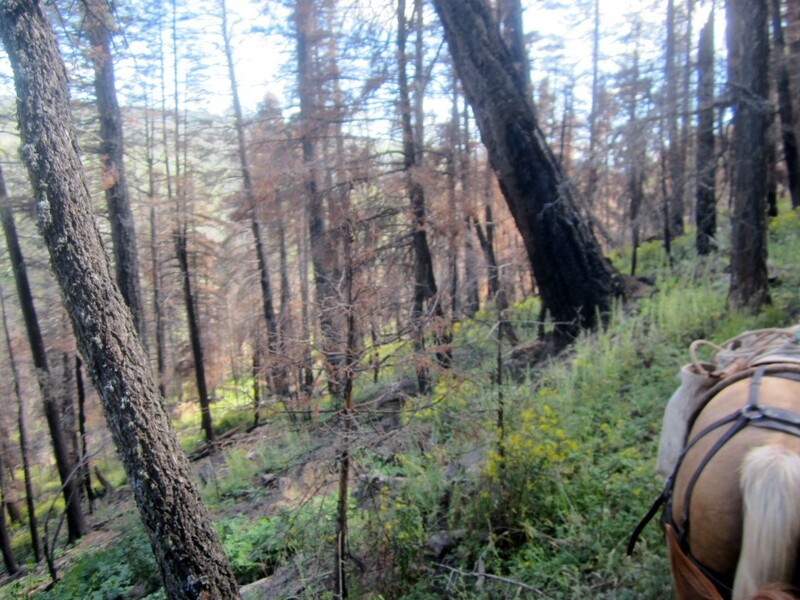 In 2013, the Jaroso Fire in the Pecos Wilderness was 100% contained on August 5th. 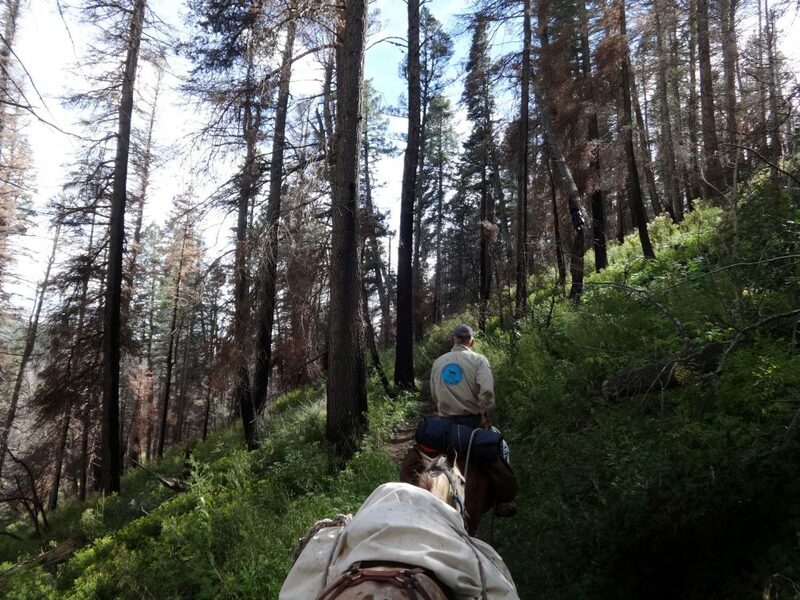 On Labor Day, 2013, the Back Country Horsemen rode through the burn area on the way to our annual trip to Beatty’s Cabin. This year’s post is from our Supply Run the weekend before Labor Day. 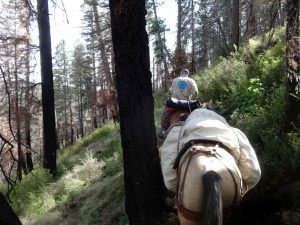 So, first the fire scar blogs and photos and then the supply run . 2013: Burn n Bridge. This is the funniest of the three, I think. It features Longshot and his non-compliant pack string ways. Longshot (now 7) was my lead horse for 2016. 2014: Bridge Club. This one features a bridge that we worked on. 2015: Beatty’s Cabin, 2015. Lots of linseed oil in this one! 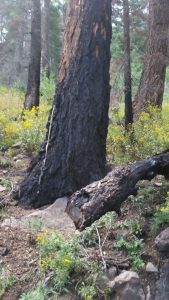 2016: Jaroso Fire Scar 2013-2016 Labor Day. The 2017 blog has a LOT of overlap with the 2016 blog. Labor Day weekend, 2013. 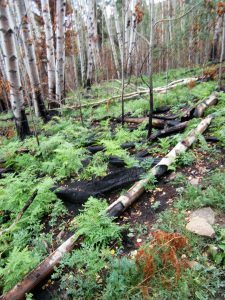 The fire was contained in August due to work of the fire crews and help from mother nature in the form of a lot of rain. The amount of regrowth that occurred in a month was amazing! Bracken fern seems to be prevalent. I really slacked in 2014. This is the only picture I seem to have of the burn scar. Still some bare spots and it looks like fireweed in the back ground and some sort of yellow flowered plant. 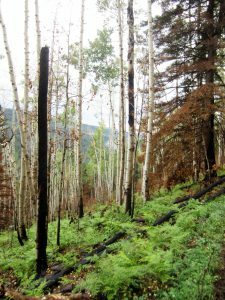 The understory is thickening year by year and it looks like fireweed and thimbleberry are common. Jim is riding Cometa and LT is packing. 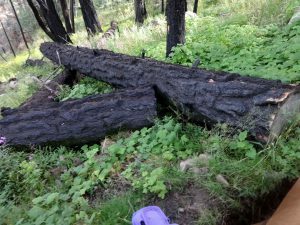 Fire scar Labor Day weekend, 2016. 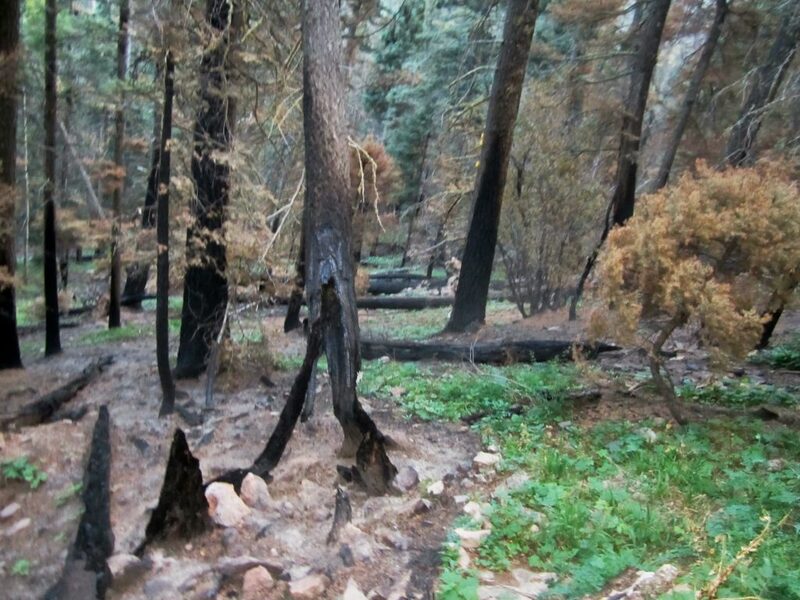 Even more ground cover and burned trees are becoming less noticeable. Lots of Thimbleberry in this picture. 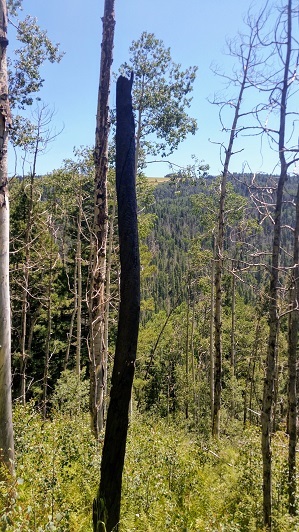 The lone black aspen, 2016. 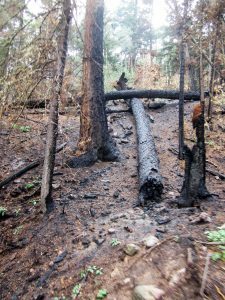 The tree trunks are still blackened, but the ground is not. 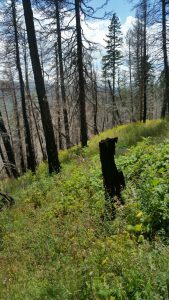 I was struck this year by the abundance of thimbleberry, but this photo doesn’t show that. I see some bracken fern and that yellow flower again. The lone black aspen 2017. 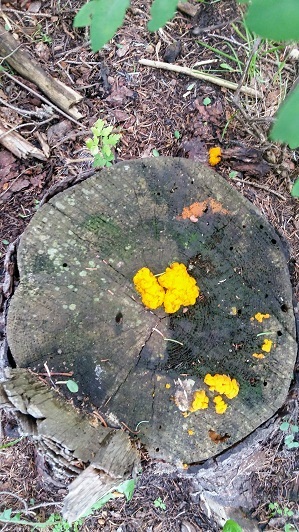 2017 entry in the Orange Fungus on a Stump contest. 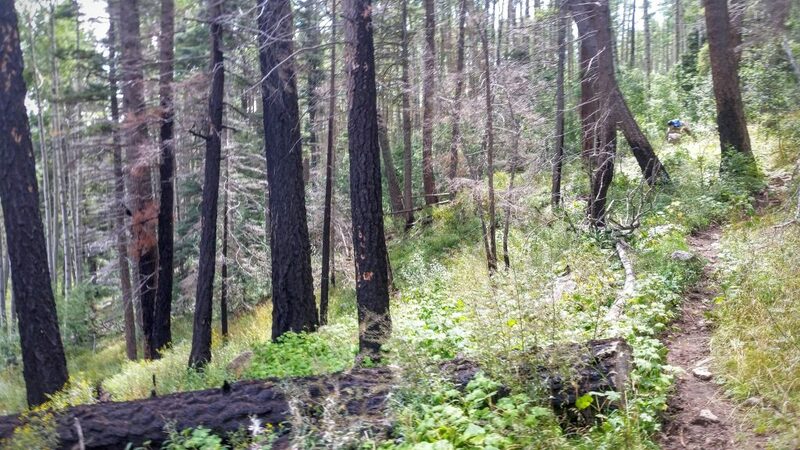 This was near the cabin and not in the burn area. The reason we were in here the weekend before Labor Day was to haul pellets into Beatty’s Cabin for the Labor Day work Crew. 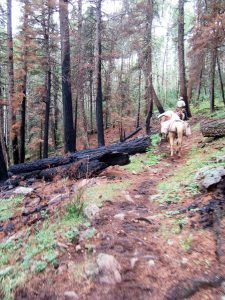 The forecast early in the week had been for 80% chance of rain, and we were anticipating a wet slog in all our rain gear, but by the time we headed out, chances were down to 20%. We had sunshine and mild temperatures. My crew: Penny, Cometa and Dexter. They are sleeping to save energy. 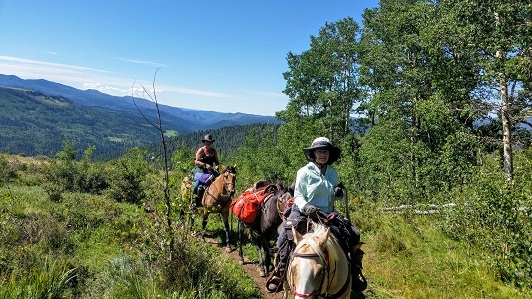 This was Dexter’s (black horse) first big back country jaunt. Cometa has his 100 pounds of pellets packed and box hitched. Peter’s group of four. 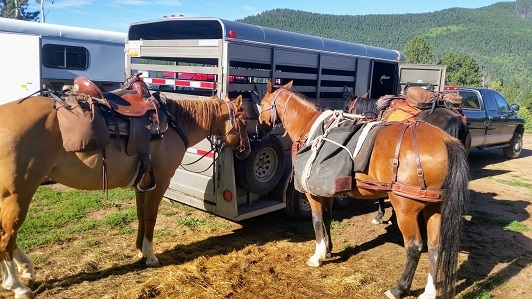 Longshot is the first packed horse in this picture. He went last year as my riding horse. 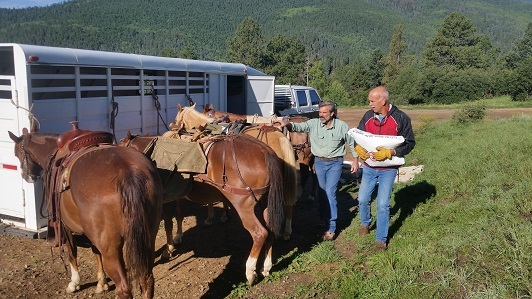 Jim is carrying a sack of pellets to be loaded. 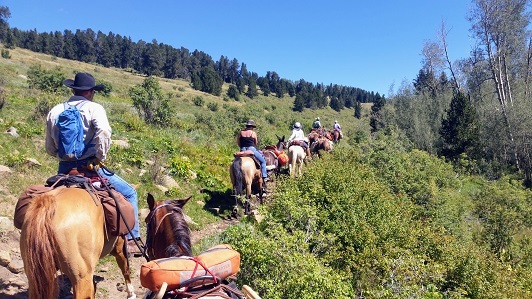 My mount, the five year old Dexter with about 40 rides total, was a bit forward to start with, but the trail is a nice steady climb out of Jack’s Creek for more than a mile, and that took the edge off. 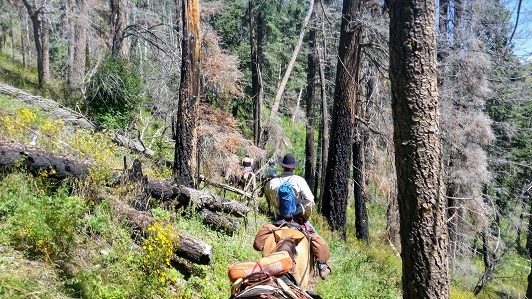 The trail junctions at about the spot shown below and we continued on #25 to Beatty’s Cabin. Siri on Booli (bred by Peter, trained by me–All Home week, here), packing her mule for the first time. Erin is keeping an eye on things. In our first cow encounter, someone’s calf was misplaced and the mama’s were bawling on both sides of the trail. Erin’s horse Phineas is not a cow fan either, and one of the mooing moms slotted into our line, right behind Erin and Phin. She dogged his tail for a couple hundred yards. Erin kept Phineas all together! I think Dexter would have attempted to barge to the head of the line if he’d been tailgated by a such a noisy body. Our whole Crew (except me) you can’t see me because I am photographing. Mary Ann, Peter, Siri, Erin, Jim. 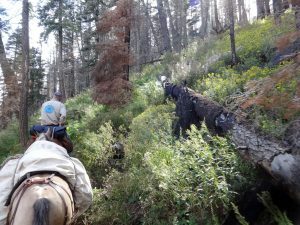 We made it to the cabin, unloaded 600 pounds of feed and some trail tools, ate lunch, repacked a little garbage and rode out (14 miles total). All of us except Siri and Erin will be going back in for Labor Day Weekend! We are taking Penny and Cometa and the third slot is down to Dex or LT. I am leaning slightly toward LT.